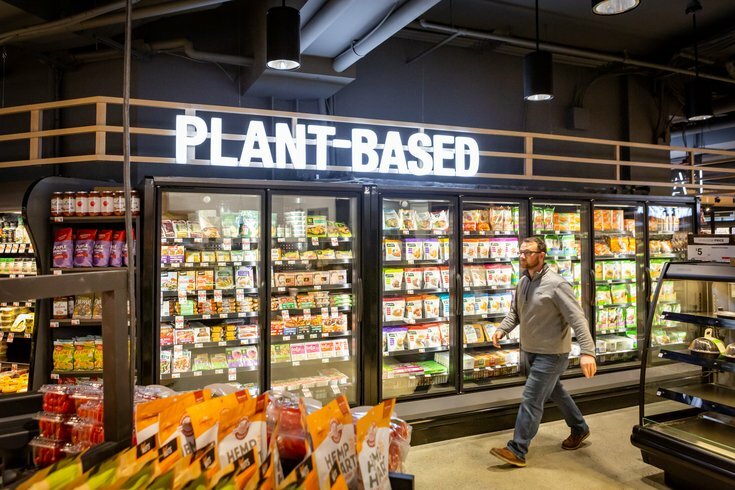 A large plant-based protein section is grouped in one location, a specific request from the neighborhood. 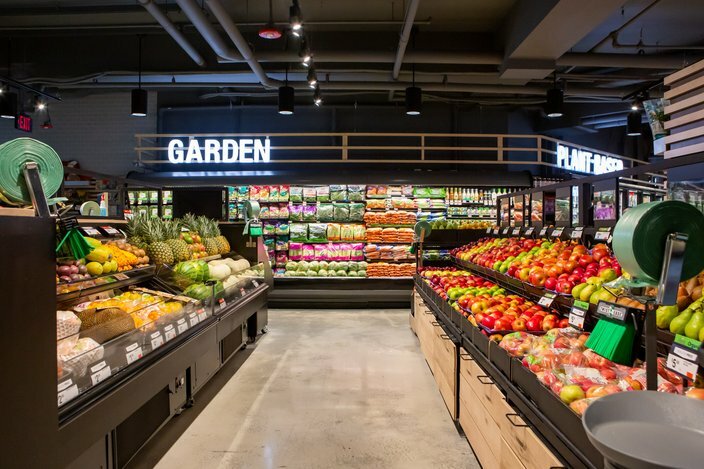 Giant Food Stotre's first foray into the urban-format concept begins Friday morning with a grand opening at the company's new Giant Heirloom Market location in Graduate Hospital. The Carlisle, Pennsylvania-based brand has been around for nearly a century — it's now a subsidiary of Netherlands-based Ahold Delhaize — and operates in four mid-Atlantic states. 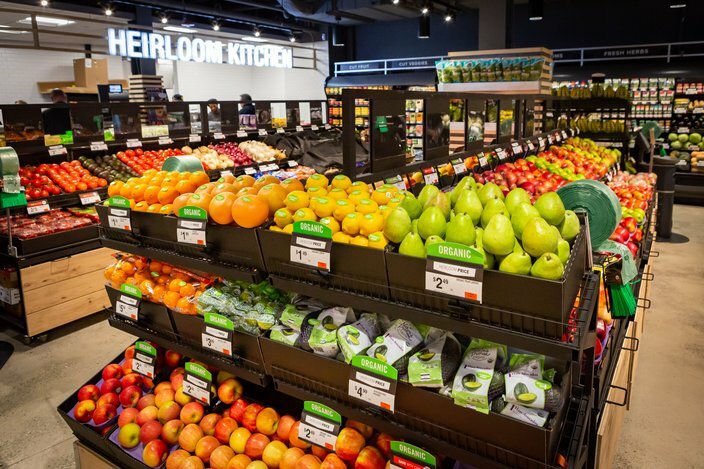 Giant Heirloom Market represents one of Giant's most innovative decisions to date — a community-generated grocery store based on months of meetings with local residents. Paul Madarieta, Giant Food's district director, was the catalyst behind the urban-style market. 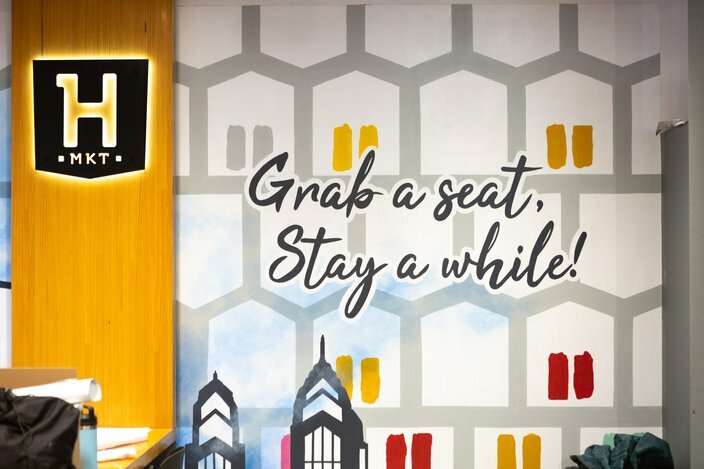 With more than 20 years of experience in the grocery industry, Madarieta saw an opportunity for the company to offer the brand's best assortment of products in an environment that suits the lifestyle and commercial reality of a city. The 9,500-square-foot Giant Heirloom Market will be open seven days a week from 7 a.m. through 10 p.m.
"Thirty-five thousand, forty-five-thousand square foot stores are very tough to come by, and there are a lot of ten-to-15,000-square-foot stores that you can possibly turn into grocery," Madarieta said. "I think people are craving this kind of thing — and one of the big draws is going to be alcohol, too." With previous experience at Trader Joe's, Madarieta is confident that Giant Heirloom Market will offer a similar but distinctive appeal. "We worked through South of South Neighborhood Association and talked to groups of people in the area," Madarieta said. Murals throughout the market were created by Philly-based artist Ali M. Williams. "We asked, 'What is it that you really want?' And what they wanted was to be inspired," Madarieta said. "They felt like sometimes, when you go into a grocery store, you don't have people that are knowledgeable. We're in the food business, but we sometimes forget that people want to taste and smell — and have all the senses chiming away when it comes to food." That's one of the reasons Giant Heirloom Market will have a full-time produce chef next to the deli and sandwich kitchen. The chef will be there to offer samples and help make dinner suggestions, often based on the produce customers bring up to the counter to be cut on the spot. The urban, small-format store in the Graduate Hospital neighborhood is a first for Giant. "Sampling is going to be a big driver of what we try to do," Madarieta said. "We want to inspire people in the afternoon when they're starting to think about what they'll have for dinner." The Giant Heirloom Market includes a do-it-yourself olive oil station, where customers can create their own flavor blends. 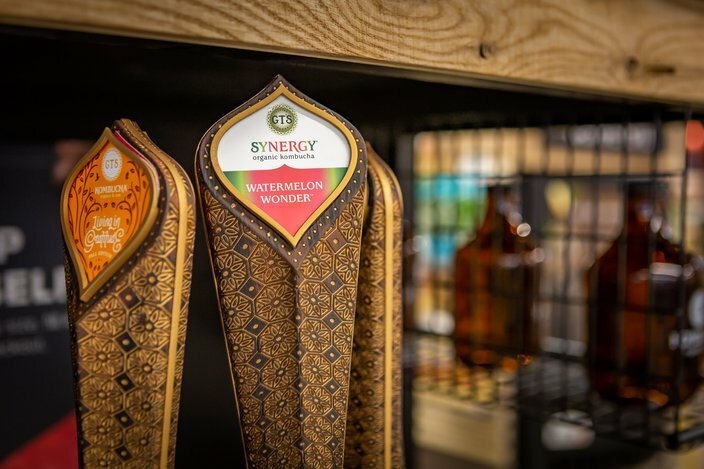 Other customer-engagement stations include a make-your-own olive oil stand with various flavor infusions and a kombucha stand to fill up growlers. There is a kombucha filling station featuring 3 different options. The layout at Giant Heirloom Market is inspired by European grocers, with bright neon-lit signs indicating a "Garden" produce section, a fully-stocked "Plant-Based" freezer set and a "Land and Sea" section for meat, poultry and seafood, for example. Shoppers will notice products from local purveyors throughout the market, whether it's fresh bread from High Street on Market, pasta from Tallutos, One Village Coffee or Isgro Pastries. 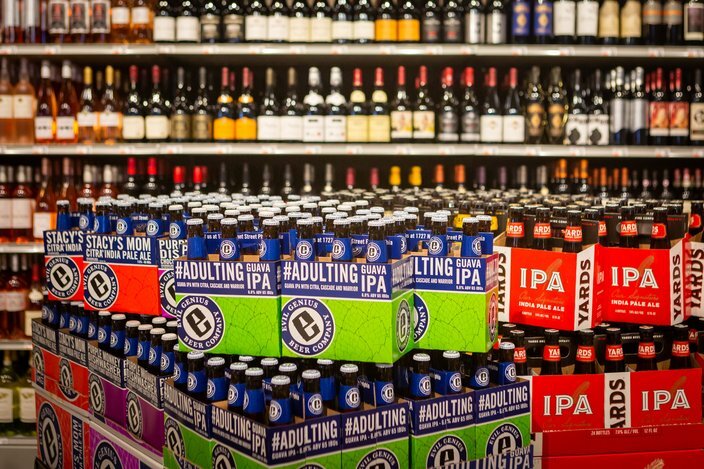 An ample selection of local craft beer and wine also rounds out the store's offerings. 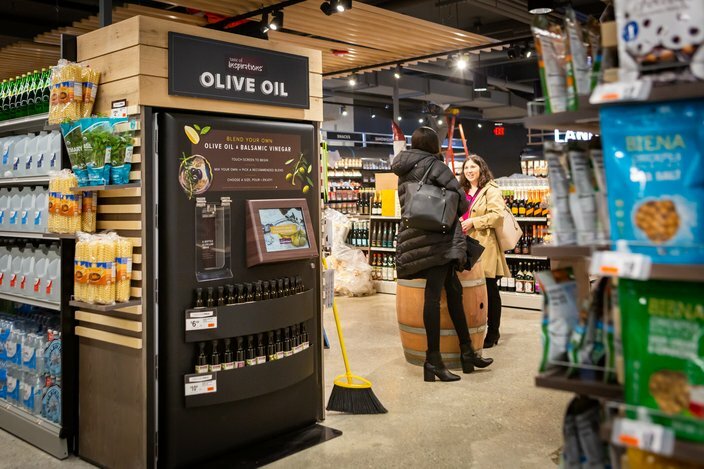 You can even drop a bottle of wine in a chiller while you shop and come back for it when you're ready to go (everything is self-checkout, with a cashless row for those who want to get in and out). The market has a large wine selection with craft beer available at room temperature and chilled. Store manager Angel Cordero explained that everything in the store has a purpose. 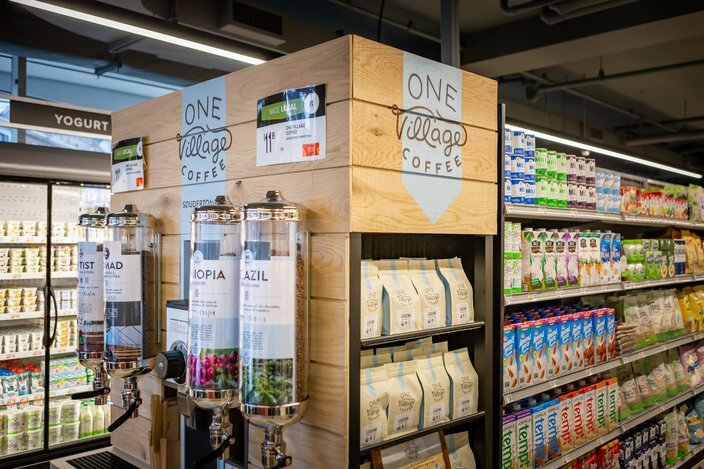 The community was polled and their input — an emphasis on ingredients and healthy, natural, organic foods — is reflected in the brand's "endless aisles" philosophy. "We know that this process, this assortment and selection, is fluid and is going to change," Cordero said. "The endless aisles idea is just another avenue to get more food and more product to the customer. We're not a big place, so everything that we have on the shelf is important. If there's a miss somewhere and the customer tells us — or the data tells us — we're going to adapt and make moves. We're going to give the customers what they want." Giant Heirloom Market will be open seven days a week from 7 a.m.-10 p.m at 2303 Bainbridge Street.